5 | 337 students enrolled. Certification in Online Currency and Commodities course is jointly certified by NSE Academy & Elearnmarkets (NSE Academy is a subsidiary of National Stock Exchange of India). Currency Markets and Commodities Markets are strongly interrelated with each other. Understanding this interrelationship can help the traders to trade effectively and increase their profitability. Certification in Online Currency and Commodities aims to provide the participants thorough understanding as well as practical exposure on both the markets and the interrelationship between the two markets so that they can make better trading decisions. This programme imparts comprehensive knowledge on the fundamentals of the currency markets particularly the exchange traded currency derivative market and its role as a risk management tool.It will also help the students to gain a complete understanding of the commodity market specifically the role of demand-supply mechanism,seasonality government policies in the commodity market as well as the role of Macroeconomic Indicators(MEIs). 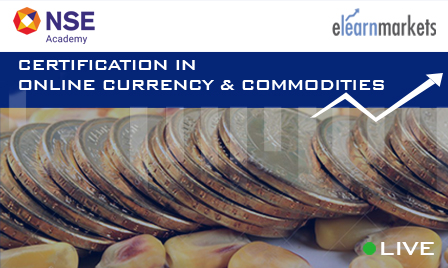 Certification in Online Currency and Commodities aims to teach the students the use of Currency Derivatives as a mode of reducing uncertainties in the currency markets.This programme will also enable the participants to understand the fundamental analytical framework to analyse various commodities, as well as the impact of MEIs on commodity prices.After going through this course,the learners will get a clear idea of the trading clearing and settlement mechanisms of Currency Derivatives, various data analysis techniques in commodity markets as well as the scope of MEIs in programmed trading. Students enrolling for Certification in Online Currency and Commodities program will be given a “Certificate of Completion” from NSE Academy, facilitated by Kredent Academy. The participants will also be given free access to related webinars conducted by Kredent Academy for further knowledge enhancement. The students can post all their queries in the discussion forum while pursuing the course. Certification in Online Currency and Commodities is useful for individuals who want to become professional traders in the currency and commodity markets.New Investors, Retail Traders, Brokers and Sub brokers, Financial Service Professionals, students preferring to build their careers in the currency and commodity markets can also benefit from this course. Under this course “Certification in Online Currency and Commodities”, the participant will be required to appear for the internal examination and NCFM examination. Please note that the participant will get the Certificate of Completion of Certification in Online Currency and Commodities after successfully clearing both the examinations. NSE Academy certification in Financial Market (NCFM) Examination: This examination is hosted by NSE for which you need to go to the NSE approved test centre. The participants have to appear for the NCFM Currency Derivatives: Beginners Module preferably within 45 days after the completion of the module/ course. Once the student enrolls in the Certification in Online Currency and Commodities, he/she has to do NCFM registration. This is necessary in order to get the login credentials, so as to book the test date and the test centre to give the examination. Click here to register. Qualifying marks:50% , There is no negative marking in this module. The exam fees for the NCFM Currency Derivatives: Beginners Module are Rs 2,006 (two thousands six only) inclusive of service tax.